A big crowd of 50,000 watched both this event and the local schools championships. 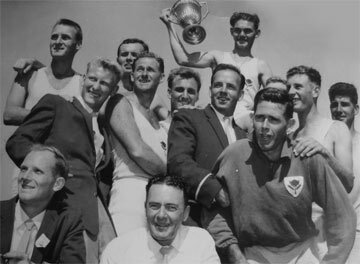 2nd VIC - Bow: Hubert R Frederico, 2: James G Howden, 3: David H Boykett, 4: Graeme A McCall, 5: John Hunt, 6: W Neville Howell, 7: William S Arnold, Str: Geoff M Taylor, Cox: John Cockbill, Coach: Robert R Aitken, Emerg: Ian E Douglas & Paul M Guest, Manager Tom Rodda, Selectors: Ron J March, Lloyd S Williams & coach. In the eights race Victoria led for the first mile but were then passed by NSW who were then never troubled for the rest of the race. 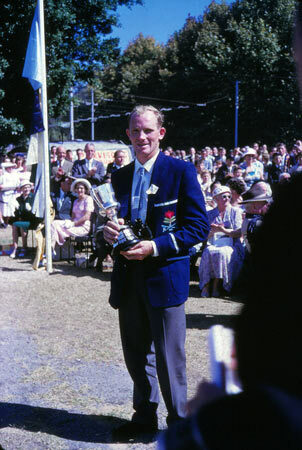 The sculling championship saw Hatfield take the lead after the first 100 yards and was never in doubt thereafter. 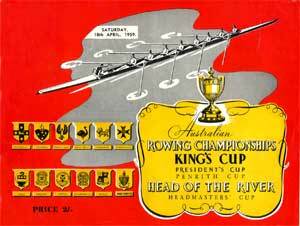 The Victorian sculler had his boat smashed in transit to WA and was kindly loaned a boat by Gerry Hubbard. The lightweight fours saw WA go out early leaving the rest of the field in it's wake. NSW tried hard in the first 1000m to follow but the race was over with WA taking an easy victory. It was the first championship won by WA in WA. The NSW women again won well but not without a challenge from the Victorians.